It’s actually starting to feel like Spring in Northeast Ohio, so this sauce is a fresh, bright horseradish vinaigrette. It’s funny – the more recipes I post, the more I’ve been thinking about why I cook certain things. I know that my cooking has been influenced by my CSA and trying to use in season veggies whenever possible, but I’ve noticed recently that the weather also has a major effect on what I cook. Now that it’s a little warmer and the sun is making a rare appearance, I find myself wanting food that’s lighter, with lots of citrus and fresh herbs. Plus, it’s much more pleasant to grill when you aren’t wading through snow! This is another recipe inspired by the book Smart Chefs Stay Slim. I typically only think of vinaigrettes as salad dressing, so I was quite intrigued by the idea of serving it over a steak. I first tried the recipe as presented in the book, but although the flavors were great, it seemed a bit oily. I adjusted the amounts, added a splash of lemon and tried using the food processor instead of blending it by hand. Perfect! The bright green color from the parsley and thyme were so pretty. 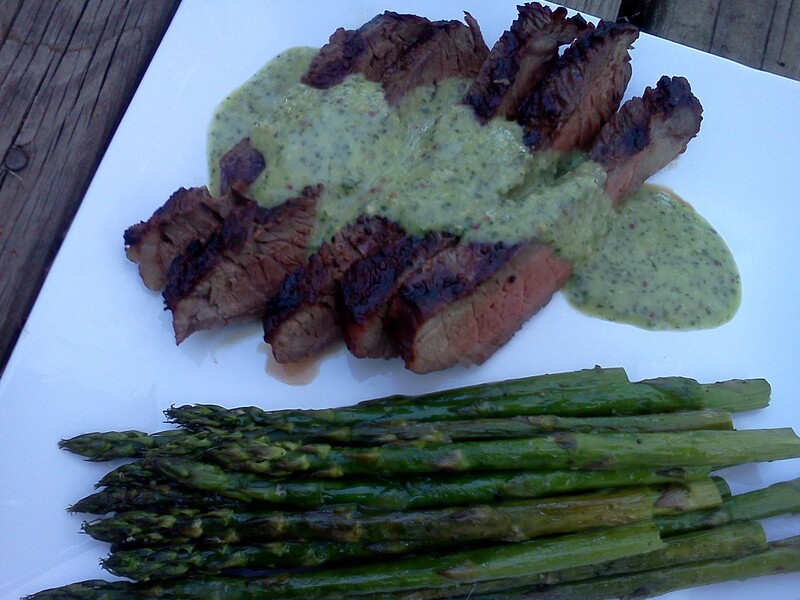 I made this version with a top sirloin (grassfed) grilled simply with olive oil, salt and pepper, and some roasted asparagus. The little bite from the horseradish and the vinegar, and the freshness of the herbs were such a good combination! This vinaigrette is so easy! Add all the ingredients except the olive oil to a food processor. Blend for a few seconds until all the ingredients are combined. As the food processor is on, add the olive oil in a thin stream through the hole in the lid. Blend until smooth. Taste – add salt and/or pepper as needed. That’s it! Use to top steak, fish, veggies – just about anything! It might even be good as a dressing on a sub sandwich – Yum! Does your cooking style change with the seasons? What are your favorite spring/summer dishes? This entry was posted in Dinner, General, Grilling, Recipe and tagged horseradish, sauces, seasonal cooking, sirloin, vinaigrette on April 14, 2013 by Melissa. This looks tasty! Ever since I was a little kid enjoying Sunday brunch at the Prime RIb (with horseradish sauce and popovers alongside the eggs and salad bar) I’ve loved horseradish on beef. 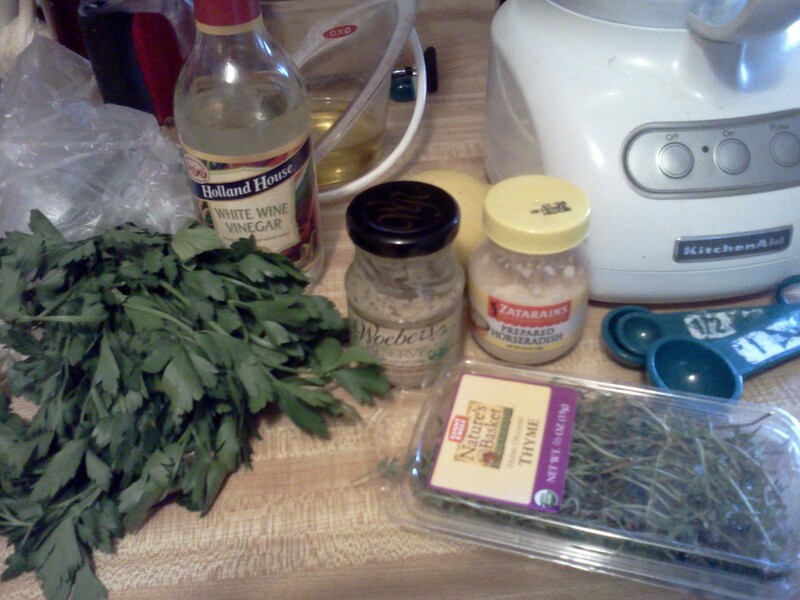 I think the vinaigrette idea with fresh herbs is wonderful. Thanks, Kirsten! As a kid, I was never a fan of horseradish, but it’s grown on me over the last few years. I want to try this with fresh grated horseradish instead of a jar next! I am with you, I always change my recipes for Spring/Summer. Gone are the big pots of stews and chili. Much more lighter fare, like mussels, fish and grilled veggies. Cold pasta salads are something I never make in the winter, but always make in the summer. One constant year round, antipasta/cheese plates & wine. Weather it is in the house ,cozy with the snow falling or outside by the pool! Whoops spelled weather wrong and I think antipasta. Oh, well !!! Close enough! I agree – once the spring/summer weather hits, I really don’t want heavy stews and things like that. I’m trying to cook more fish and less red meat this summer. Adjusting a recipe to your own preferences is a sign of an experienced and wise chef. Yum! I think that sauce would be delicious served over grilled salmon and asparagus! Yes? I will ask Kim to make it. It’s funny around here. Our cooking does change with the seasons, but also your Uncle Kim and I each have our specialties. I cook “Mom” food like chili, spaghetti sauce, mac and cheese, chicken with dumplings, and also pizza and frittatas and roasted vegetables. I make all desserts except that he makes homemade ice cream, but only in the summer. Kim does all of the grilling and that includes grilled vegetables and potatoes. Which means he will soon take over most of the cooking! I will make a lovely salad! Ha! And we try to eat outside on the deck every single day! The flavors in this dressing sound really good, and I’m so ready to get some warm ready. It’s freezing today. This weather is crazy! I’m ready for it to stay spring for more than one day at a time.